One of the most expected days of the entire year is getting closer and closer, and we need to get prepared right? Yes, we’re talking about the Halloween, that day of the year when gaggles of kids took to the streets by themselves, but the adults are also enjoying it, sometimes more than the kids. That’s why we thought about preparing some great apps and wallpapers, so that you can fully enjoy the holiday spirit with some creepy and funny Halloween themed apps from the Android Market. We selected just a few to present you, but there’s more than just these on the Market. Now, let’s begin with the Sliceween game which is a funny physics game where your goal is to get the bat and to into the house, but to do that you’ll have to slice everything that stops you from your way to victory using bars, bricks, spiders, teleporters and some other stuff. Sliceween features 4 different worlds with 80 levels. 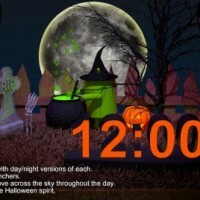 The second on our list is the Halloween Clock which is a really cool widget, just perfect for you Android device. It has a festive Halloween theme, and features a little witch called Andy, brewing away in his cauldron. Pretty cool huh? More than that, the widget uses 3D graphics, features a great amount of details and it’s highly customizable. The Haunted House HD is a cool live wallpaper that allows you to travel not only inside, but also around the outside of a haunted house, bypassing the candle-lit pumpkins and you can customize the mailbox with your own name. This widget offers you the possibility to customize most of the things from the scene, choose your own personal pumpkins and you can decorate your haunted Halloween house. We will be more than glad to find out what’s your favourite apps for the Halloween holiday, so don’t hesitate to share all your favourite apps and wallpapers with us!